We manufacture these sink from super grade stainless steel, which ensures their impeccable quality and long time operation. High utility product with or without advantage of work table . Facilities for washing cleaningetc, with sinks incorporated as per operational needs . Stainless Steel sound deadened tops andsinks at convenient locations. (Single, Double, Triple). Option of splashguard and full or partialundershelves. Choice of metals variations. Available in custom built designs and sizes. Laboratory countertops sinks made out of 304 316 grade stainless steel to withstand most reagents corrosive chemicals. Design is strong durable to ensure longevity of countertop. We manufacture a superior range of three sink units that are used in community kitchens, hotels and restaurants. These sink units have three parallel basins fused in a single structure. 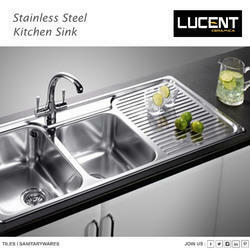 The stainless steel body helps to keep the sinks corrosion free. Large number of utensils can be cleaned in these sinks simultaneously. 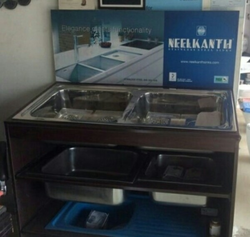 We offer these three sink units to our clients at industry leading prices.